Preparing to head into the great outdoors has always always been a delicate balancing act. You want to bring enough gear to be prepared for any weather, without overpacking and creating a heavy pack. With its new Futurelight material, The North Face believes it has created the ultimate fabric for outdoor adventures: one that’s versatile enough to keep the wearer completely dry, while also keeping them cool and comfortable. Making clothing that can repel rain and snow isn’t difficult. You could wrap yourself in plastic garbage bags and hike for hours without a single drop of rain getting through. But the problem with that approach is that plastic-like waterproof materials effectively block everything trying to pass through, including air and heat. I can remember wearing a rubber rain suit while working construction jobs and still finding my clothes soaking wet with sweat at the end of the day because my body was essentially trapped inside a stifling, wearable greenhouse. Having to pack outerwear that’s suited for wet conditions, as well as garments that can keep you cool during vigorous activities, isn’t ideal when you end up carrying it all on your back. That’s why The North Face believes its new Futurelight material will be such a game-changer. It’s been engineered at the nanoscopic level to prevent water molecules from passing through, while still allowing air to move freely so the wearer doesn’t overheat. It’s a best-of-both-worlds approach that might actually deliver as promised. 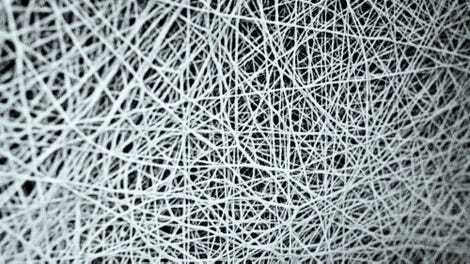 To create its new Futurelight material, The North Face also developed a new manufacturing process it calls nanospinning in which a fibrous material is extruded and repeatedly layered on itself into an ultra-thin and flexible web-like structure. The unique process results in millions of nano-scale poles being produced, which allow air molecules to permeate the material, while water molecules can’t. Another big advantage of the Futurelight material is that it’s not limited for use only on raincoats. That thin nanospun layer can be bonded to a variety of different fabrics, making almost any garment completely waterproof: be it lightweight, heavyweight, insulated, durable, breathable, or flexible. Raincoats are notorious for often being stiff and uncomfortable to wear, but The North Face could potentially use its new Futurelight material on any wearable product in its catalogue, for example, a jogging suit, yoga wear, or a parka engineered to survive a trip to Everest.